This is an extremely useful rescue knife that I keep on me at all times when out in the wilderness. The blunt tip is perfect as it doesn't compromise cutting edge. The straight edge is awesome as well as it makes cutting predictable and slip free. 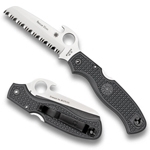 The blade is mostly serrated, which is what I'd want in a rescue knife...great for cutting clothes, straps, ropes, etc. Visible orange FRN, lockback, spyderhole deployment and VG-10 are all great. Another feature that's interesting (although admittedly I don't use it all too often) are the finger grooves on the spine of the blade which allows you to squeeze the handle and the blade together to cut rope. 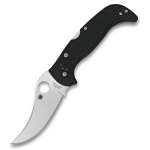 Overall top notch for a rescue knife and the price is right for a VG-10 knife.